Just twelve months have passed since we announced our first cohort for the inaugural SheStarts Accelerator – inspiring founders who have taken on us a whirlwind ride as they turned their ideas into thriving tech startups, ready to change the world. And now we’re ready to get started again with the announcement this month of our second cohort of SheStarts founders selected for our Accelerator kicking off in January – a phenomenal group of women ready to make a big impact in 2018. But before we clock off for a couple of weeks of R&R, this is our chance to say thank you for being part of the journey. Thank you to our community – to every single one of who has supported the vision of SheStarts from the very beginning and joined us on our mission to change the face of startups. Thank you to the incredible mentors, advisors and collaborators who have backed every one of our SheStarts founders, generously giving their time and expertise to provide a hand-up to these amazing women. Thank you to our corporate partners – especially ANZ, MYOB, Microsoft and LinkedIn – who share our determination to drive female leadership in tech and entrepreneurship and put all their collective might behind this program to make that vision a reality. And to the Australian Government who are supporting us to expand the work of SheStarts in driving international growth, commercialisation and investment for our alumni. And most of all, thank you to the founders – to Carla, Claire, Anna, Emma, Madi, Lauren, Xiao Han, Sally, Jess, Lucinda and Naomi – who have shared their stories through the highs and the lows, the real and the raw, to inspire other women and girls to get started. From all of us at SheStarts and across the entire BlueChilli team, we thank you for making 2017 a year to remember. 1) In January, we kicked off the first SheStarts six-month accelerator program and introduced eleven new female founders to the startup ecosystem – ready to change the world. 2) The founders took their startups from Pitch to Prototype; travelled from Sydney to San Francisco to meet with tech leaders and VCs, with the support of our friends at Google; and returned to Australia to present their businesses to Australia’s top investors, marking the cohort’s graduation from the accelerator. 3) Since completing the accelerator in August, the first group of alumni have continued to kick massive goals with the support of our team at BlueChilli; raising capital (including the $1M round closed by Emma Poposka for BronTech); securing major enterprise customers in banking, property and government; being invited to take part in international delegations; speaking at global conferences; and winning awards as emerging leaders in Australia’s startup ecosystem. 4) Meanwhile, our first season of the SheStarts documentary web-series, captured by the incredible team at theStoryboxes, has been winning awards of its own. The series took out Silver at the prestigious Mumbrella BEFEST Awards, after it reached more than half a million views, showing women that you don’t have to be a dude in a hoodie and sneakers to be a tech entrepreneur. 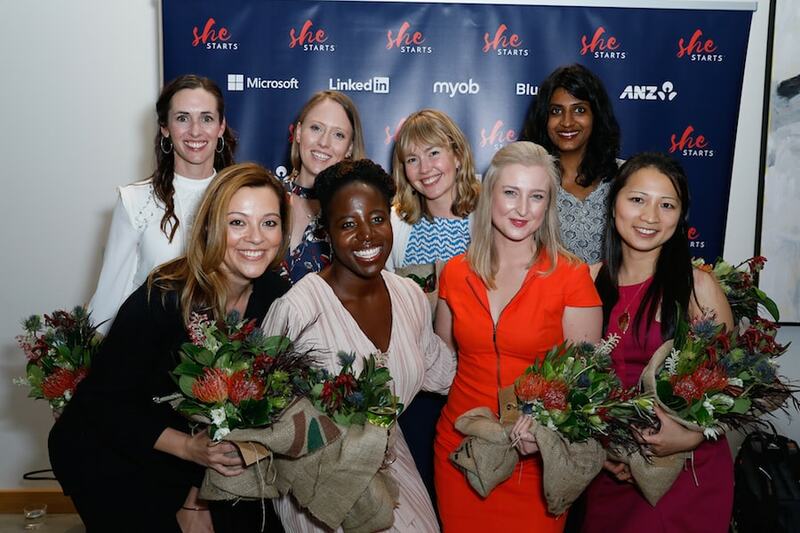 5) Just days later, SheStarts was named Australia’s Accelerator of the Year at Startcon – a tribute to the amazing team behind the program at BlueChilli, and the women who have launched their startups with us in our first year of SheStarts. 6) This ambitious program is now reverberating around the world, showcased as global best practice for inclusive entrepreneurship at the OECD in Paris and on French TV, at the APEC Women Business Leaders Forum in Seoul, and all over Australia at events like VogueCodes and Myriad. 7) And to round out the year, we announced our second cohort at this month’s SheStarts Selection Showcase, surrounded by our friends and partners from across the startup community – welcoming this remarkable group of women ready to launch startups with SheStarts in 2018. None of this would have been possible without the incredible support of an entire ecosystem of champions who have backed us every step of the way. People who have supported our founders on their startup journeys, shared their stories to inspire others and provided a platform for this ambitious program to go global. People like you, who share our vision for changing the face of startups. We can’t wait to see what 2018 holds – and look forward to finding out, together. Best wishes for a relaxing and rejuvenating holiday season!